Histone demethylase required for G2/M phase cell cycle progression. Specifically demethylates dimethylated 'Lys-36' (H3K36me2) of histone H3, an epigenetic repressive mark, thereby acting as a transcription activator. Regulates expression of CCNA1 (cyclin-A1), leading to regulate cancer cell proliferation. 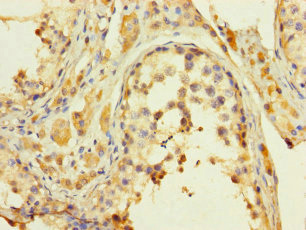 KDM8 Polyclonal Antibody. Unconjugated. Raised in: Rabbit.